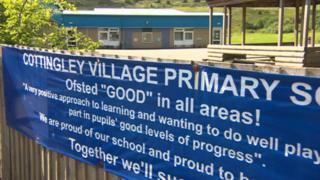 A primary school in Bradford is considering changing to a four-and-a-half day week in a bid to save money. Cottingley Village Primary said in a letter to parents budget pressures left it needing to look at cost cutting without reducing staff. Parent Anne Villien said the move would cause childcare problems for many. The three main political parties have pledged more money for schools as head teachers around the country deal with rising costs pressures. The letter, sent out by head teacher Nichola Geale, urges parents to have their say on the proposals. It states: "We believe that changing the school day would both save the school a lot of money and also allow us to improve teaching and learning." It said the change could involve school starting earlier, from 08:30 or 08:40, instead of the existing time of 08:55 and finish "Friday at lunchtime for all pupils". The letter goes on to say staff would remain in school on Friday afternoon for preparation, planning and assessment time. It adds: "At the moment, this is done during the week which interrupts learning and also costs the school as we have to pay for other teachers to be in classes". The school has proposed to bring in the change from September. Ms Villien, whose daughter attends Cottingley, said: "It is a such a fantastic school and it's disgusting that financial pressures are meaning it has to consider something like this. "It means a lot of parents are going to have to look for childcare, which is not easy to find for the odd few hours. It's scary to think that this is the way many schools could be forced to deal with budget constraints." Neither the school or Bradford City Council would comment on the proposals.